The Viola da Gamba is a 6-stringed bowed and fretted instrument that first appeared in Spain in the mid to late 15th century and was most popular in the Renaissance and Baroque periods. 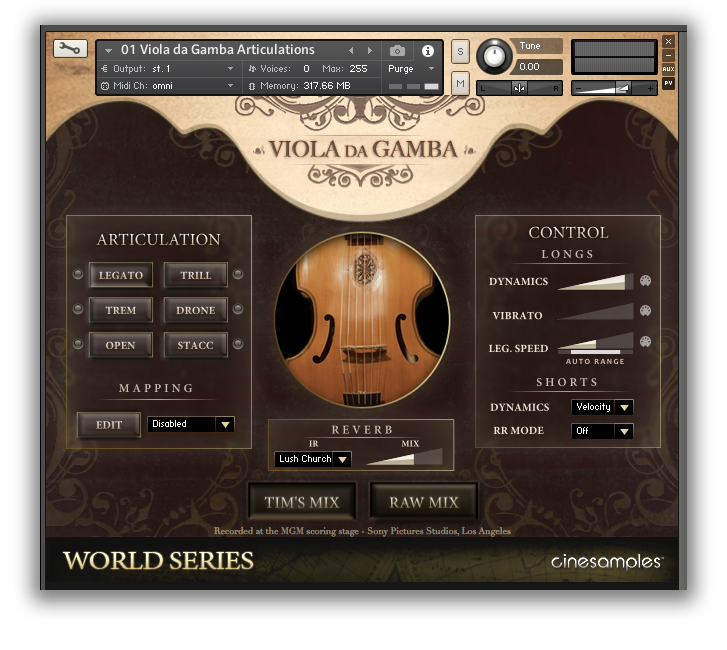 A great combination of articulations and textures perfect for melodies and beds, Cinesamples' Viola da Gamba was recorded at the MGM Scoring Stage in Los Angeles. D1, G1, C2, E2, A2, and D3. Viols are fretted in a manner similar to early guitars or lutes, by means of movable wrapped-around and tied-on gut frets. The movable nature of the tied-on frets permits the viol player to make adjustments to the tempering of the instrument. On this particular instrument, the frets only extend 7 semi-tones on each string. The main articulations patch contains sustains, True Legato, staccato, chug, sforzando, pizzicato (via the red keyswitch), with an optional accent overlay. What is True Legato? We sampled all of the intervallic leaps throughout the ranges, upwards and downwards, for each instrument. When you play a True Legato patch, it instantly analyzes the intervals you play, and then plays the appropriate transitional leap between the notes. The result is a smooth and realistic legato performance. CC02 will crossfade into vibrato on notes D3 thru D4. Vibrato is stable only on non-fretted notes on the Viola da Gamba. The Drones patch contains Measured Sustains, Trills, Tremolos, Sul Ponticello Drones, and Open Strings. By default these articulations are chosen using keyswitches. The Split Keyboard patch is essentially a combination of the Drones patch and the main Articulations patch. The lower octaves keyswitch between Measured Sustains, Tremolos, and Sul Ponticello Drones, while the upper octaves play sustains and legato with the pedal down and Staccato with the pedal up. The two halves of the keyboard can be played together or independently. Most patches contain a green, non-latching Keyswitch. Hold it down before transitioning to a note you want played with an infinite sustain. This is understandably an unnatural occurrence, but it provides the necessary bow length needed in slower tempi. Click EDIT on the main page to reach the ARTICULATION MAPPINGS page. This allows you to access any of the instrument’s articulations and play them however you choose. In this example (01 Viola da Gamba Articulations) the legato samples are triggered when the pedal is down. When the pedal is up, short articulations are triggered depending on note velocity. 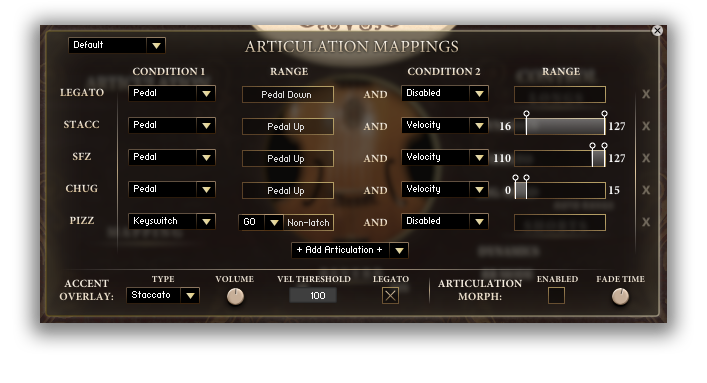 The Articulation Mappings page also contains an optional Accent Overlay, which layers an additional Staccato, Chug, or Sforzando sample when a note is played above a user defined velocity threshold. In the Drones patch, the keyswitches select the type of drone. The drones can be switched, or cross-faded mid-note and can even be layered. Enable this feature in the EDIT tab. The crossfade time can be adjusted using the FADE TIME knob. The Measured Sustains were recorded as whole notes at 60 BPM. Therefore their bow changes will occur every 4 seconds. As an added bonus, after playing a note, the bow changes of additionally layered subsequent notes will play in sync with the first.